*The spike is not coated! Hi'Res-C probes suffer less contamination than silicon SPM probes and allow obtaining many high-resolution scans when proper care is taken during use. Due to the small tip curvature radius, the tip-sample attraction force is minimized. 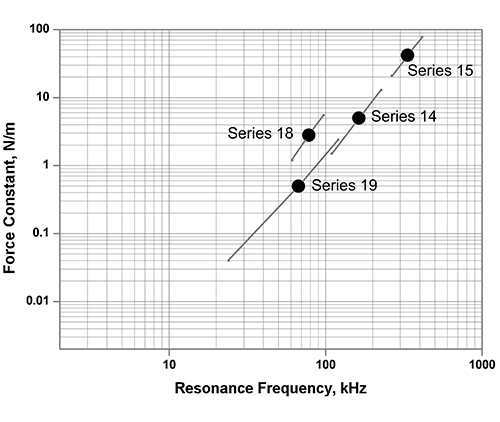 The advantages of the Hi'Res-C probes are noticeable when scanning smaller areas (<250 nm) and flat samples. On larger images, the resolution is similar to that of general purpose probes. 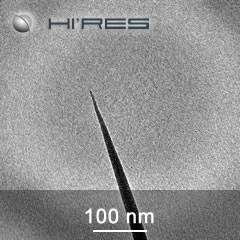 The Hi'Res-C probes are not suitable for corrugated samples.